My tutoring students are often rattled by this chapter, but the confusion usually melts away once they see how arithmetic and geometric sequences are "the same but different". It's just two different sets of equations, but if you've got them at your fingertips (click on thumbnail to the right to see a pdf of all the formulas for sequences). Also in this chapter there's a whole video *just* about SAT sequence questions since they're so common. Most students won't still remember their sequence formulas when the SAT comes around, but that's actually okay because SAT questions are usually designed so that the formulas wouldn't help you anyway. In this video we introduce geometric and arithmetic sequences, talk about the differences between explicit vs recursive formulas, and do lots of problems that don't require the formulas for arithmetic and geometric sequences. In this video I cover how use all the formulas for arithmetic sequences and series. We'll learn what an nth term is, how to find it, how to find the sum of an arithmetic sequence, how to find the "common difference" d, and how to find arithmetic means. In this video I cover how use all the formulas for geometric sequences and series. If you've already seen arithmetic sequences, this is going to be similar, except you'll definitely need a calculator, and the common difference gets replaced by the common ratio. 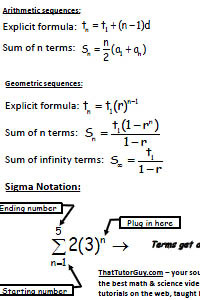 Sigma is just a Greek letter (I assume it's Greek since it's on the front of every frat house in the world) that looks like a cross between Z and E, and when you see it in math class it translates roughly to "you're screwed". Kidding! It actually means "sum", as in, "add all this stuff up." It's not too bad once you see how it works, but most teachers seem unable to make it non-confusing. I realize most students won't still remember their sequence formulas when the SAT comes around, but that's actually good, because SAT questions are usually designed so that the formulas wouldn't help you anyway!